We are planning to set up our Beloved Dead altar this weekend – so this is a perfect card for me. Hope it helps some of you. Blessings! That reflects my heart so true. 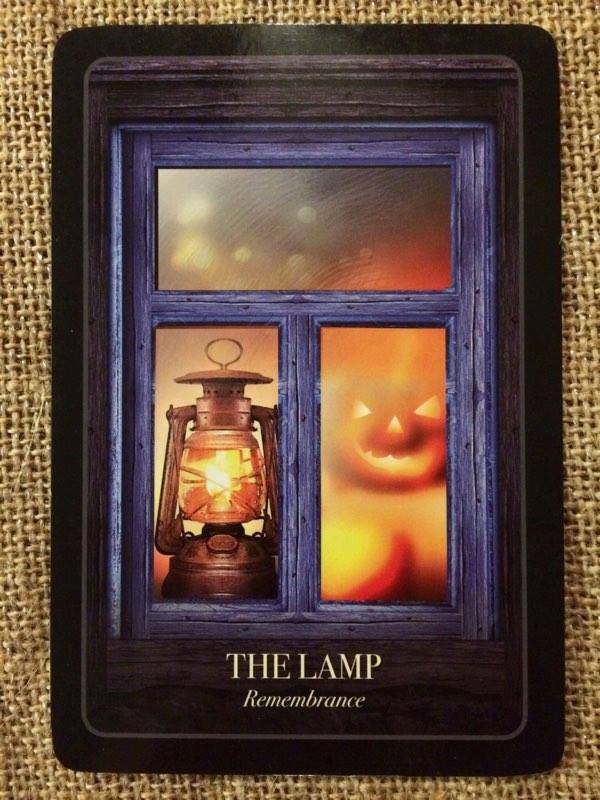 While it is a tradition to carve a jack-o-lantern to scare away the spirits, it was an older tradition still to light a candle or a lamp on Halloween night and leave it at the window as a loving guide for those who have passed. Both as a symbol of remembrance and also as a kind of “leaving the lights on” for those who may wish to come home, the lamp was left on to illuminate the night and perhaps even the sadness that was felt because of the passing. This card reminds us that it is a positive thing to remember those who have passed by celebrating their life rather than mourning their death. For those with whom we did not have an easy relationship or even those we did not like, leave us with valuable lessons. Sometimes, we learn more from our nemesis than we do from our friends and so the darkness can illuminate our strengths and our true values so that we can live them ore clearly and fully. This card is back! While we may not be divining our future marriage or money prospects, it’s good to keep a goal for the future while enjoying the present. A glimpse of my fate’s completenessNot quite a cake and not quite a bread, barmbrack is a sweet loaf, larger than a typical bread loaf, baked with flour, sugar, salt, and dried fruits such as raisins. 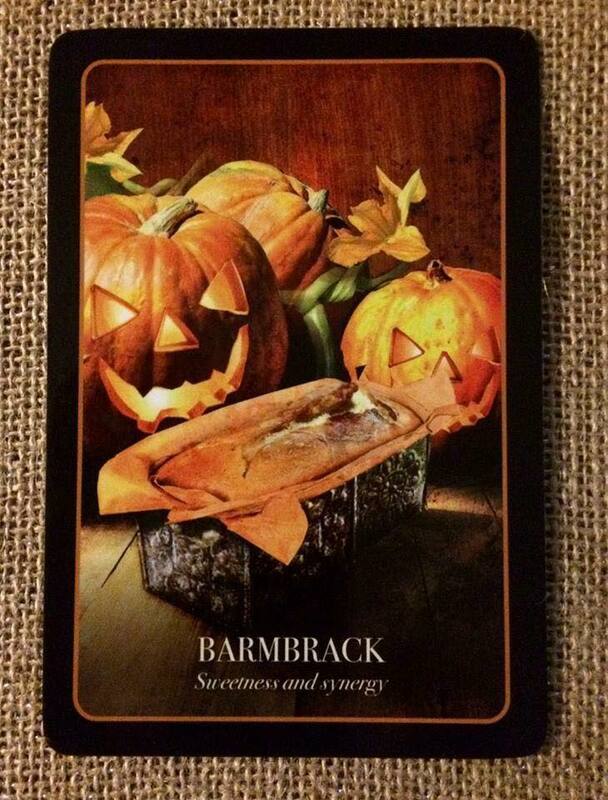 The making of barmbrack is an Irish tradition that still stands around Samhain. The person baking the loaf would be sure to set the intention for love, truth, and synergy whilst preparing. Inside the dough, a number of special objects are hidden and baked into the loath. The objects are used as a kind or random oracle – each one has a particular meaning which represents the fate of the person who found it in their slice! The traditional objects include a coin, a pea, a stick, a ring, and a small piece of cloth like muslin. Some other additions, made in more modern times, were religious medals. Should your slice of brack contain a coin, this would indicate prosperity and good luck. The pea unfortunately meant that no marriage would occur for you that year, yet finding the ring meant a marriage was certain. The stick – to be avoided at all costs – indicated disputes and unhappiness and finding the cloth meant bad luck and little money ahead. Ahh, the blind spots – they can get us if we don’t learn to shed light on them. Also, don’t confuse blind spots with your shadow, though they could be related but not necessarily. And our power, it has grown. 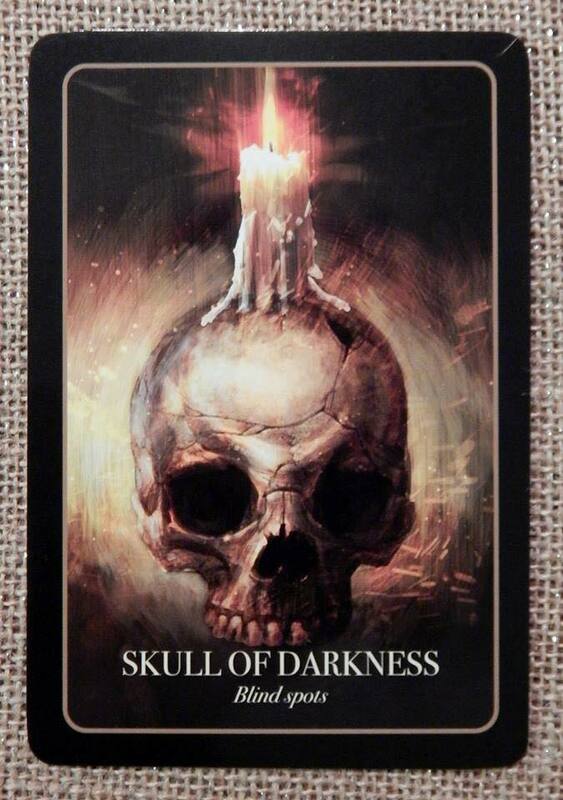 The beautiful and mysterious skull of darkness encourages us to look at the part of ourselves that normally remains hidden or as unseen as possible. We may not appreciate or like certain aspects of ourselves and yet, sometimes our greatest treasures lie within these areas. How many times have you heard of famous artists or people extremely successful in their fields being bullied for being so different – yet is these very differences from others that make them so powerful. Additionally, all of us at some stage of life have certain “blind spots” that may cause us grief and trouble. Although we cannot see the issue clearly, it is the repeated patterns of pain that may alert us to them – symptoms, if you will. For example, the same things keep happening over and over again; we may be betrayed repeatedly, fail at something repeatedly, not complete tasks continually. Peace and pattern-breaking can be achieved by doing the work in uncovering our blind spot or even consulting trusted close friends or professionals to assist us to see what we cannot. MEANING: Transformation. Take risks. Face your fears. Break out of old patterns and conventions. Just because you’ve always done something in the past doesn’t mean that you need to continue to do it in the future. Try something new. Change your routines and habits. Reach out in new directions. The Thunderbird is rising in you; out of the ashes come new growth and new beginnings. NATIVE SPIRIT WISDOM: In native cultures, fire was thought to be a gift from the creator that carried the power of renewal. Fire can maintain life – and destroy it. It is the warmth of the tribal fire, but it is also the thundering lightning bolt cast down from the sky. It can purify and transform – and it can annihilate. Fire represents your life force, the spark of life with than you, and also the pure white light within you. 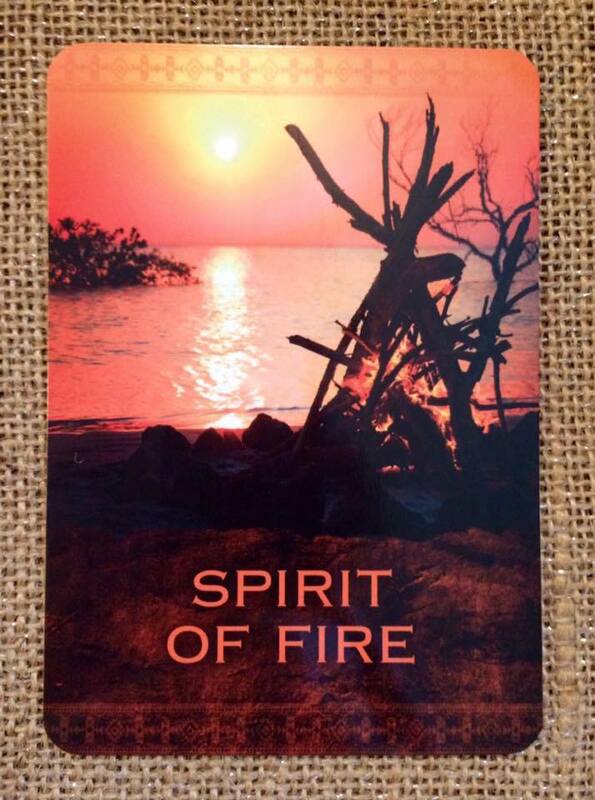 The Spirit of Fire card invites you to take some risks and to face your fears. We often are reacting to situations because of preconditioned responses based on our self-generating definition of self. Every time you change an old habit – even changing to a different breakfast food – it helps you begin to step out of a limiting definition of self. Purification by fire creates transformation. Take care to keep your energy and balance. Fire that burns too brightly burns out, but a fire that’s left to smolder dies. THE JOURNEY: When you first wake up in the morning, focus on the emerging sunlight. Imagine that you are breathing in that light. Gaze unblinkingly into a candle flame and focus your awareness on the inner flame within you. By doing this you’re activating the spirit of fire that dwells within you and around you. Imagine yourself to be a single candle flame, a camp fire, a forest fire, electricity, lightning, the Sun, and stars. Affirm this: May the light of the Sun illuminate my heart, that my heart may illuminate the world. Native Spirit Oracle by Denise Lynn, art by Charles McStravick. Seeing this card reminds me of the glorious beauty of autumn, so I guess it’s timely. Embrace the illumination and transformation that is coming. MEANING: Transformation. Letting go of the old. Initiation and illumination. Harvest. Gather your inner resources. If it doesn’t feel right, don’t go ahead. Trust your heart. Chaos comes out of turmoil; don’t be concerned if there’s confusion in your life. It will all work out. NATIVE SPIRIT WISDOM: In the medicine wheel, the west is the direction that symbolizes the fiery setting sun, autumn, the waning moon and the time of harvest, and the tumultuous years of teenagers in the human cycle. Out of the chaos arise illumination and transformation. In order for the new to ignite in your life, it’s necessary to let go of the old. Sweep away the debris. 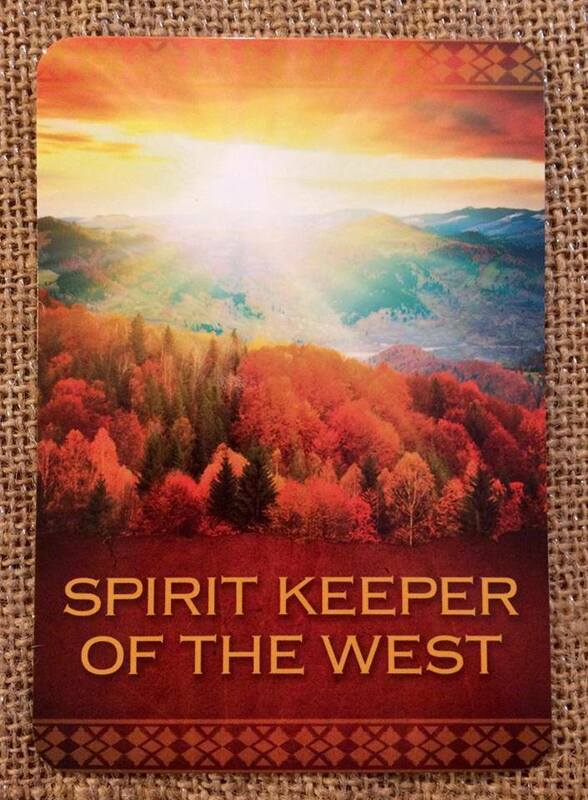 The Spirit Keeper of the West reminds us to slow down our rapid growth – and harvest what we have attained. In the autumn, leaves are burned to make way for new growth. Release the dross in your life to make way for new growth. THE JOURNEY: Stand facing the west and the setting sun. Imagine that all limitations and blockages in your life are flowing from your heart into the sun; as the sun sets, it carries with it your cares and concerns to be transformed by its purifying energy. This line in today’s card description truly speaks to me. Over the past few days, I was in a mode of reducing distractions and culling things that are no longer active in my life (much of this was on social media). Last night I was in a group conversation that showed I was not alone in feeling that we are too divided and we are distracting ourselves from being productive and from making our mark on the world. 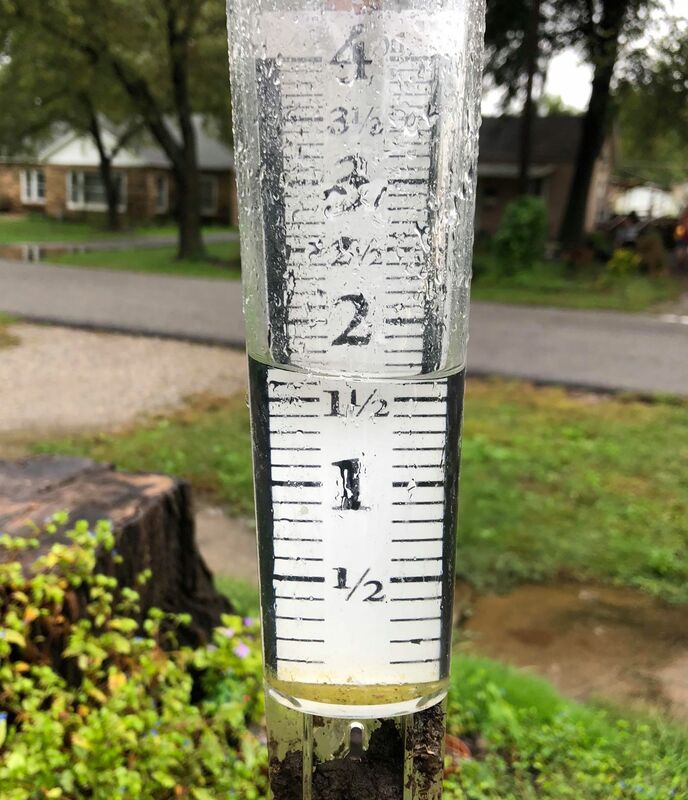 And then last night, nature washed things clean too: we received and more than an inch and a half of rain. Sometimes, nature’s augury shows us the way. If anyone else is feeling like this lately, I hope today’s card helps your achieve the wholeness of self that you need. Blessings! Meaning: All things are possible. Stand in your center and be open. The Four Winds are bringing your dreams to fruition. Embrace and accept where you are in the great circle of life. Bounty and abundance are flowing to you. If you’ve had relationship or financial challenges, things are about to change. 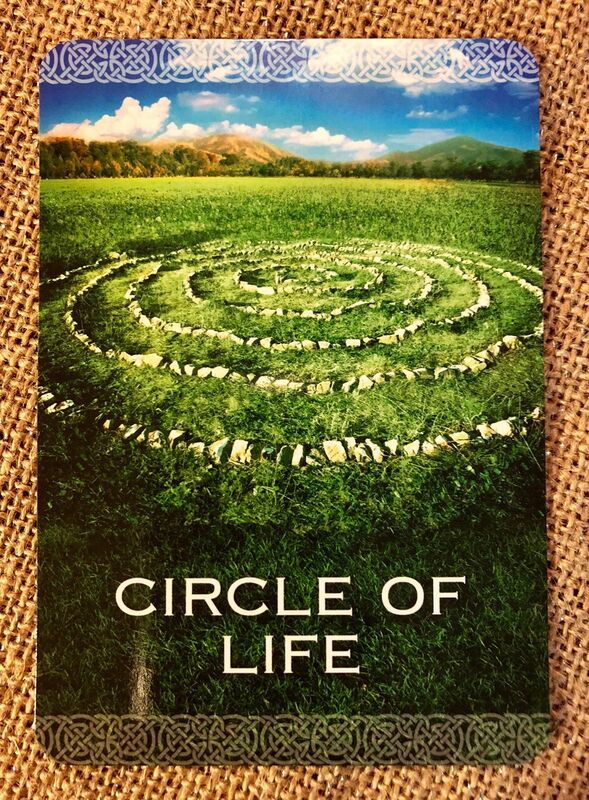 Native Spirit Wisdom: The circle of life (called “The medicine wheel” in Native American traditions) symbolizes a cosmology that honors all the circle of life. Those in Western cultures tend to see life as linear; however, those in indigenous cultures view all life as a circle. 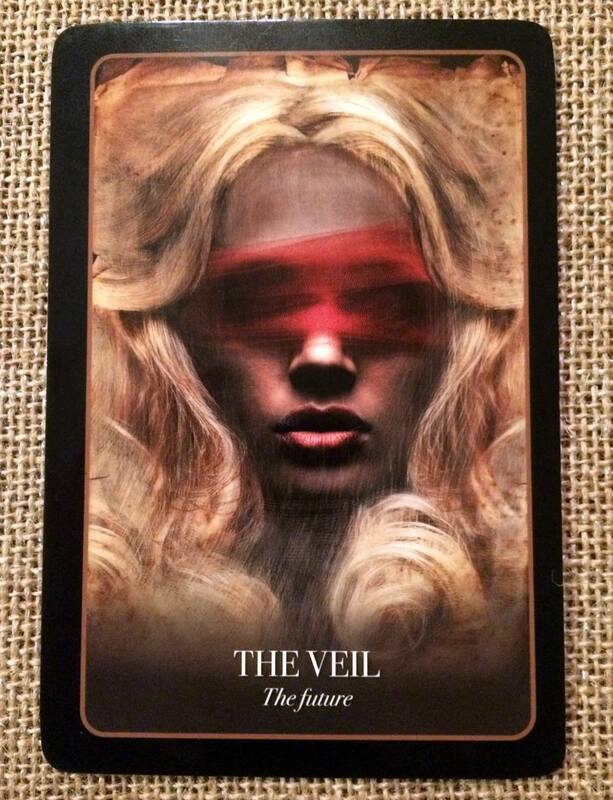 When this card chooses you, it’s time to honor and cherish all aspects of the great circle. All parts of the journey have beauty and grace. There’s beauty in the rising sun, just as there is in the setting sun. To only revel in the rising sun (and demean times of endings) depletes your energy. Choose what is and you become master of the Universe (or at least of your own personal universe). The Journey: Create a medicine wheel for yourself. It can be as simple as creating a circle of stones that you place on your desk or making a circle of stones or pinecones that you lay outdoors. As you place each part of the circle, hold the intent that you’re honoring all aspects of your life.